Let kids doodle, write, and play tic-tac-toe with this no-tech alternative to screen time. So many toys, but your kids only want to play with your phone. Instead of handing it over, try Michele Chiaramonte's no-tech alternative. 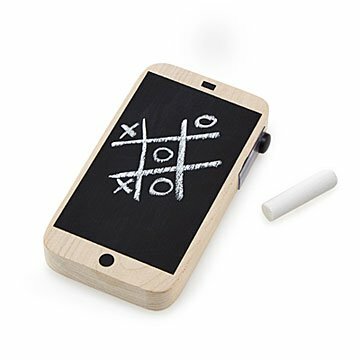 Kids can doodle, write, or play games like tic-tac-toe on the chalkboard "screen" while sparing yours. And they'll never have to search for chalk because the design has a side slot to store it, cleverly disguised as a power button. When the doodling's done, they can practice quick calls to set up a play dates. Handmade in Bellport Village, New York. For her first Mother’s Day, Michele Chiaramonte's husband gave her what every new mom dreams of: A portable table saw. The former New York City public school teacher put her career on hold when her daughter was born, but a new form of teaching came along. She has always believed that thoughtful play equals learning, so Michelle started creating wooden toys for her daughter. When friends saw them, they asked if she would make pieces for their children, too. These small batches of handmade toys turned into a small business. "My goal is to create simple toys that allow children to be curious about the world around them," she says, "and focus on what sparks imaginative learning."